I wish they all could, Tickle. I really do. But then SoV's quality would be slipping. That's your job, to only allow the absolute best of the best. Well, thank you all for considering my custom. If Unukk happens to find his way into any of your games, please drop by my customs thread and post a report. Thanks. I'm just one judge, GameBear, and the others all voted to review. These are my votes. Except for the Blood Raptor and Eremon Vandel, for which I cast the second vote, these units are all still in the pipeline. Last edited by Dad_Scaper; May 8th, 2011 at 12:03 PM. Reason: oops, I'd forgotten about killo's vote. Sorry I've fallen behind. Updates should get up in the OP this evening. Last edited by Killometer; May 9th, 2011 at 11:51 AM. I'm excited to try Baabas' Knockback explosion (but I am going to be apt to drive people crazy be drawing out the Baaaaaa-Bas every time I do ), and I might as well bring his friends along, so I vote YES to review Herd Chief Baabas and Ibixian Ridge Raiders by Typhon2222. Blood Raptor by krysto2002 has received 2 NO to induct votes (Dad_Scaper, ZBeeblebrox) and is removed from the process. Eremon Vandal by clancampbell has received 2 NO votes to induct (Dad_Scaper, nyys) and is removed from the process. Unukk by GameBear has received 2 NO votes to in duct (Dad_Scaper, Killometer) and is removed from the process. Crypt Guards by Super Bogue has received 2 NO to induct votes (Dad_Scaper, nyys) and is removed from the process. Whatever happened with the zombie hulk? I would like to get it into this week's W@HS, but I'm not sure where it's at in the process. Also it would be really nice to have a display thread to link too, but that might not be ready in time. It been approved and dok has created a book for him...we are still working on the display thread. I would like to nominate Cxurg'gyath. The mini can be found at Reaper, Collstuffinc, Miniature Market, Auggies, and more. Some inventory numbers would be a bit more helpful Tolamos, can't really make an informed decision without them. 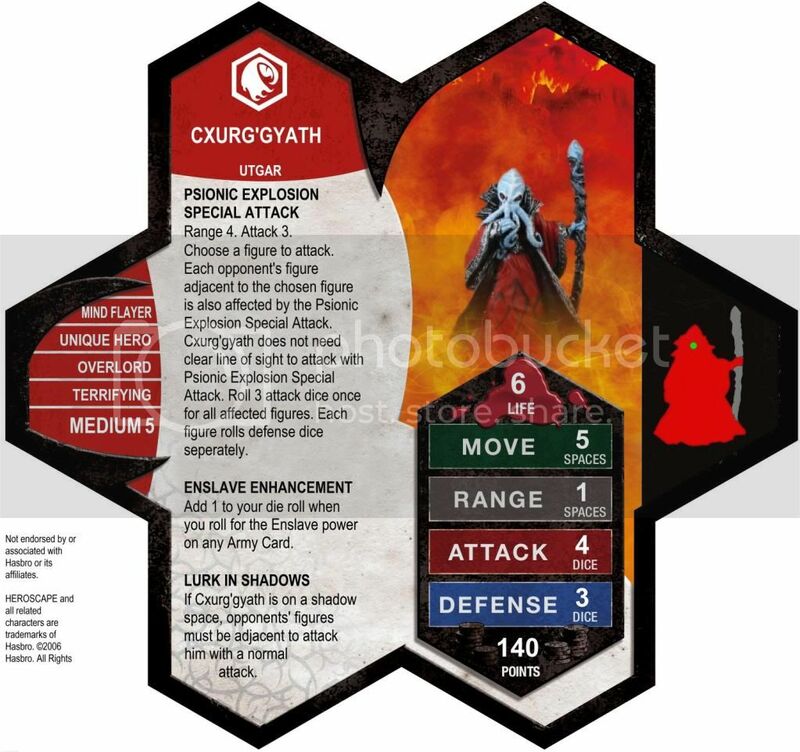 The Figure is From Reaper, Legendary Encounters. It is called "bathalian." Reaper Miniatures - Seems like they have an unlimited Amount. Wonder Trail - It let me add over 100 to my cart. CCG Armory - It let me add over 100 to my cart. The custom figure + Card is currently being sold by Auggie, who I believe is able to order more at any time. Maybe? Another option for the figure is D'Kuhl. It is the same figure, but is metal and does not come painted. Last edited by Tolamos; May 11th, 2011 at 11:57 AM. to reviewing typhon's Ibixian family. to reviewing Tolamos' Cxurg'gyath. He is one of my two or three favorites of all the customs in Auggie's display case, but those availability numbers are not high enough.